Funerary art is, according to Wikipedia, "any work of art forming or placed in a repository for the remains of the dead... an aesthetic attempt to capture or express the beliefs or emotions about the afterlife." 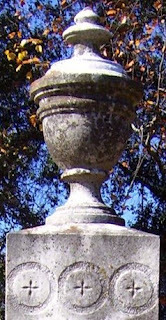 The urn is probably second only to the cross as the most common example of 19th century funerary art seen in the cemetery today. That is a little surprising, actually, given that these cemeteries contain burials, not cremations. For centuries before Christ, cremation was the most common form of disposing of dead bodies in Europe and the Near East. It was dominant in Greece in 800 B.C. and in Rome by 600 B.C. Early Christians considered cremation to be pagan, however, and by 400 A.D. earth burial had completely replaced it. Modern cremation did not come about until the 1870's. Many cemetery symbolism lists state the urn represents death, sorrow, and mourning. Fewer suggest it symbolizes immortality. This might stem from the ancient Egyptian belief that life would be restored in the future through vital organs placed in the urn. 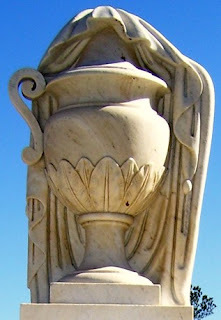 A more specific description of the what the urn symbolizes today is given by Kimberly Powell at genealogy.about.com: "The urn is commonly believed to testify to the death of the body and the dust into which the dead body will change, while the spirit of the departed eternally rests with God." Oftentimes, but not always, an urn at the top of a gravestone will be draped. This could add another layer of meaning to the art. The cloth could symbolically guard the ashes. 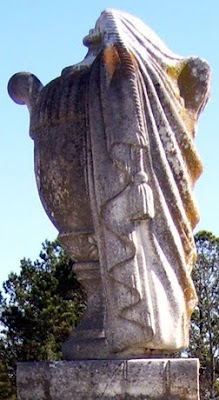 Douglas Keister, author of Stories in Stone, states the drape can also be seen as a symbol of the veil between earth and Heaven. All photos © 2009 S. Lincecum.